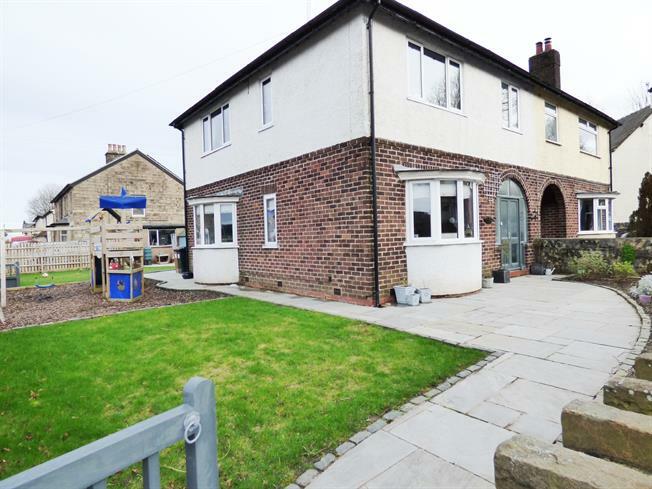 3 Bedroom Semi Detached House For Sale in Buxton for Asking Price £265,000. This outstanding semi-detached property has been completely refurbished to now offer accommodation of the highest standard throughout and would make a great first purchase or provide a very comfortable move for those looking to upsize and improve upon their current home. An enclosed storm porch opens to a generous entrance hall, a living room with log burner and bay window, a family/dining room with bay window to side, a stylishly refitted kitchen and a rear internal lobby with access to a spacious utility/laundry room to the ground floor, whilst a roomy first floor landing leads to three well proportioned bedrooms, a stunning bathroom complete with a roll top bath and a separate walk-in shower enclosure, and a separate wc and the spacious loft space has been partially boarded with ladder access for storage. Other features include gas central heating, uPVC double glazing, karndean flooring to most of the ground floor, generous landscaped gardens, a driveway and a detached garage. Viewing is highly recommended.